Turkey trouble: what’s behind it and what does it mean for emerging markets? Turkey’s currency, the lira, has plunged 68% against the dollar since the start of 2018. Year-to-date its stock market has fallen nearly 18% and inflation hit 16% in July, more than three times the central bank’s target. Turkey’s current crisis has been a long time coming. The early warning signs were apparent in the 2013 “Taper Tantrum”, but while many emerging market policymakers heeded the tremors, Turkey’s did not. Today, as then, the underlying problem is the country’s high degree of reliance on external financing, though this is worse today than it was five years ago. Short term foreign financing needs stand at some 18% of GDP, and close to 450% of central bank FX reserves1. Analysts have warned at least since 2013 that these exposures left Turkey vulnerable to a “sudden stop”, in which foreign capital simply stops flowing, Friday 10 August saw those fears crystallise. Perhaps three factors have been instrumental in bringing matters to a head. First, and the most immediate, looks to have been the sanctions imposed by the US last week. Though not macro-economically significant in themselves, they brought the threat of worse to come, particularly restrictions on Turkish exports to the US, a key source of foreign exchange revenues. This ensured a harsh light was shone on Turkey’s external vulnerabilities. Second, central bank independence has long been questionable, and the institution’s failure to hike interest rates at its latest meeting had already triggered pressure on the currency, given that inflation is within touching distance of 16%. Third, the gradual tightening of global liquidity, with the US Federal Reserve hiking rates and withdrawing quantitative easing, means markets are far less forgiving of unforced errors than in the past. It does not look like Turkey is poised to exit the crisis in the near future. The country needs an aggressive interest rate hike – opposed by its president. It needs a resolution to its dispute with the US over the arrest of an American pastor – again opposed by its president. It also needs slower economic growth to help bring imbalances under control – again, opposed by its president. There is no apparent source of relief for financing pressures either, with the US obviously not disposed to assist, the International Monetary Fund2 potentially hindered by US opposition, and traditional allies like Russia, Saudi Arabia and Qatar either estranged or facing financial pressures of their own. 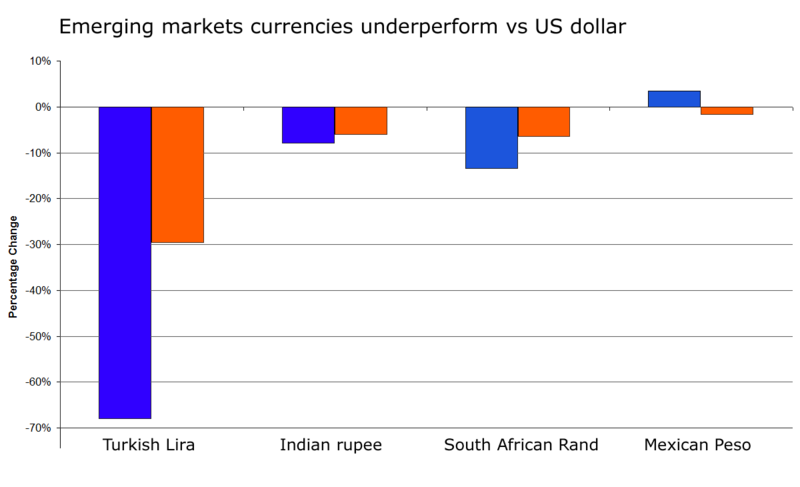 For now, the rest of the emerging markets (EM) seem to be suffering guilt by association, with currencies as diverse as the Mexican peso, Indian rupee, Russian rouble and South African rand all weaker. Turkey itself actually poses limited risk to other EM economies; financial and trade linkages are minor. There may be some risk that European banks, particularly in Spain and Italy, reduce exposures to EM more broadly because of losses in Turkey, but for most EM economies this is not that significant, not least because European banks had already retrenched following the European debt crisis. Blue bars represent the year-to-date performance. The orange bars represent the month-to-date performance. Source: Schroders and Thomson Reuters Datastream. Data correct as at 13 August 2018. Market attention may focus on other economies with similar attributes to Turkey, but there is no economy with all of Turkey’s problems. South Africa has some similarities when it comes to external financing needs, albeit on a smaller scale, but it also has a truly independent central bank and inflation under control. Russia is likely suffering because of its own recent encounter with US sanctions, which could be escalated further. But beyond these two it is hard to see why other emerging market economies should be made to suffer, beyond a general reduction in global risk sentiment. 1. Source: Thomson Reuters DataStream, Bank for International Settlements, national accounts and Turkish central bank. Foreign-exchange reserves (also called forex reserves or FX reserves) are money or other assets held by a central bank or other monetary authority so that it can pay if need be its liabilities. 2. The International Monetary Fund (IMF) promotes international financial stability and monetary cooperation. It is governed by and accountable to its 189 member countries. Previous Previous post: Emerging markets: increasing or decreasing risks? Next Next post: What can we learn from the shape of the yield curve?